Healthy Habits Trainers Graduate from Program! Thank you to our ten 9th graders who served as trainers for the fifth graders at Farrell Schools this past year. 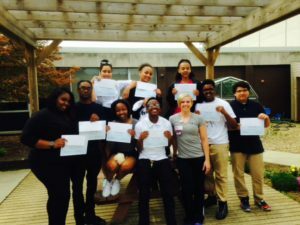 These ninth grade students went above and beyond by being our first students to participate in the Healthy Habits for Life program as fitness trainers. 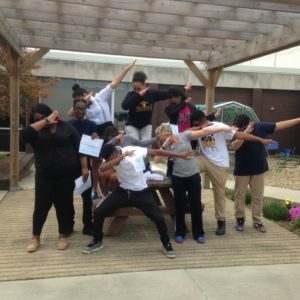 This year, these ten students taught healthy eating and exercises to their 5th grade peers at Farrell Schools. UPMC Horizon Wellness Center’s Heather Parks presented each of the ninth grade trainers with a gift card to Dunham’s and a participation certificate. The program is funded by the UPMC Horizon Community Health Foundation. The program, initiated in 2014/2015 school year has been in the development phase. Now, the program is ready to fully implement for the 2016/2017 school year. Do you know of of a school that would like to see this program? Read the Program Information and complete the Application. Next Post: It Was a Great Day for Golf!